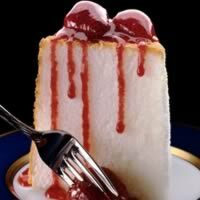 Cake can be served with whipped cream and fresh berries, or frosted with a lemon or chocolate glaze. Beat egg whites and cream of tartar in mixer bowl with whisk attachment on high speed until foamy. Continue to beat egg mixture, adding granulated sugar, 1 Tbsp at a time. Be sure each sugar addition is dissolved before adding the next. Continue beating until whites are glossy and stand in soft peaks. Beat in vanilla and almond extract, if desired. In a separate mixing bowl, sift powdered sugar, flour, and salt together twice. Sift about 1/2 cup of the flour mixture over egg whites. Fold gently just until flour disappears. Do not stir. Repeat sifting and folding in flour mixture 1/2 cup at a time. Pour batter into ungreased 10 x 4-inch tube pan. Gently cut through batter with metal spatula to release any air pockets. Bake in center of 375°F oven until top springs back when lightly tapped with finger, 30 to 40 minutes. Invert cake in pan, with tube resting on a bottle. Cool completely, about 1 1/2 hours. To remove cake from pan, run a thin knife between side of pan and cooled cake to loosen all around, taking care not to tear the cake. Repeat, running knife between center tube and cake.